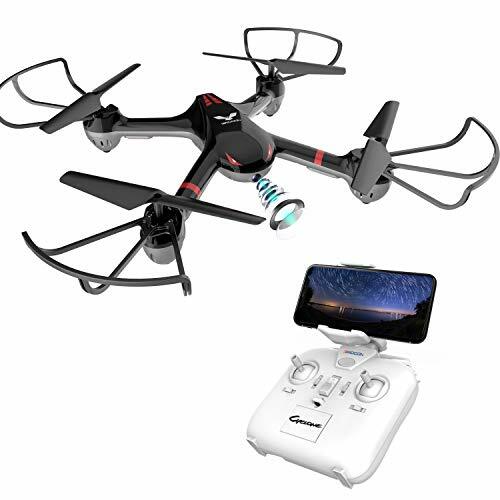 #10 Best drones under $100 in 2019 you can buy right now. Drone technology has come a long way so take to the skies with the very latest and cheapest drones! Up until a few years ago, the thought of owning a drone was unimaginable – unless you had a lot of money to spend. However at some point, owning one became something real – something that was actually achievable, as well as affordable. The only problem back then was that you had to pay a fortune for a drone. Unless you were some kind of rich heir or a mad scientist with the knowledge, you would have no ways of ever getting your hand on a drone. Now, however, drones are everywhere. We use drones to advertise real estate. We use drones to record weddings. And now, we even consider using drones in the army. Talk about protecting our soldiers from harm. From now on, we basically let our “robots” battling it out. Still, there are so many things about drones that we don’t know yet. Who was the first one to ever come with the concept? What was the first actual drone like? Was it anything like the present-day drones? Probably not; but we’ll find out about that later on. If you plan on buying a drone, you need to consider every aspect possible. For starters, why do you need a drone? Depending on what you are using the flying device for, its video quality may change. Its flying ability may be superior – but if the resolution is no good, then you may not have much use for the drone. The price is also a matter of importance. You can find drones that cost as little as $100 – but you can also find drones that make you think “it’s not like I need two kidneys anyway.” So, how do you differentiate between a good drone and a bad one? Most importantly, how do you know it’s worth paying $500 for a flying robot? Most of the time, it’s not. You can get a very good drone for as little as $100. You just need to know what features and specifications to look for. The rest will simply lay itself out. Picking out the best drone is certainly a difficult decision – but with a little bit of research, it can be done. We will also bring you as much information as possible in this guide so that your purchase is ultimately worth it. As long as you know what to look for, it’s easy to find the right drone. Still, it’s always safe to get a second opinion, which is why we have decided to review 10 of the most popular drones. 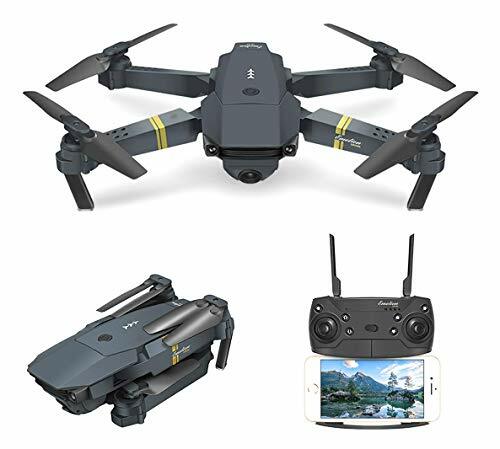 Here’s a quick overview and comparison table of the top 10 best drones under $100 in 2019 that we take a closer look at on this page. There are drones that you can’t say are for beginners – but are only slightly suitable for hobbyists. This model is the best if you are “transitioning” from one stage of droning to the other. The Holy Stone F181C is especially convenient if you tend to travel a lot since it’s not that heavy to carry around. While its design may not be all that different from your average quadcopter, the materials from which it was made ensure that it’s lightweight and easy to transport. With just a bit of practice, this drone is very easy to operate – making it perfect for beginners. Plus, it has superior responsiveness to the controls, meaning you can easily turn it around whenever the situation asks for it. Bottom line: If you want something that is both lightweight and easy to control, the Holy Stone F181C is definitely the right choice. It may not have a camera that can be used professionally – but for a beginner, it’s more than enough. If you are looking to fly something more stylish into the air, then you might want to give the Holy Stone HS160 Shadow a try. This drone was indeed made to cast a shadow – but one that is as clear as darkness in daylight. With a 720p camera, this model is perfect for beginners and hobbyists. It may not have such a high resolution, but the color palette makes up for this, bringing up the contrast. 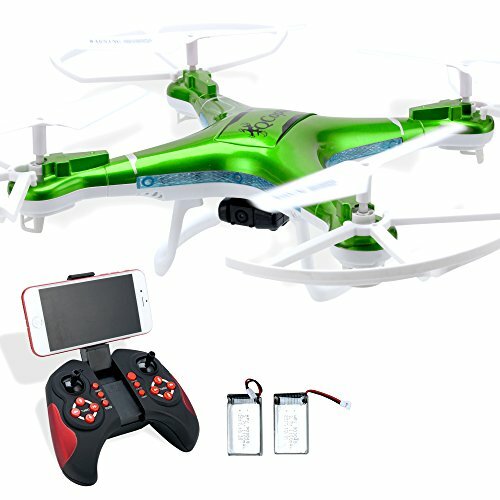 The drone does not have a battery length bigger than the average beginner drone; however, it does come with a set of extra rechargeable batteries that you can change whenever you want. Bottom line: The Holy Stone HS160 Shadow is semi-beginner, semi-hobbyist. It offers clear image and decent control, regardless of where you are using it. 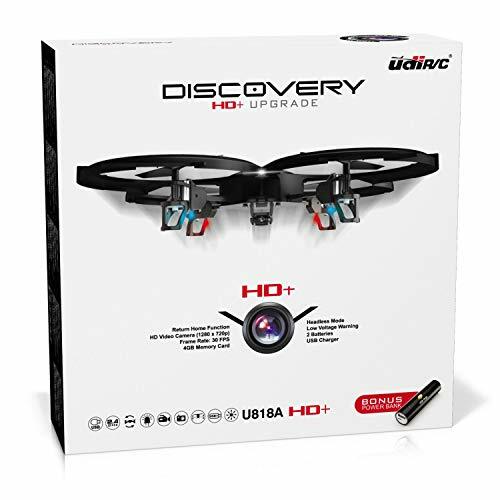 Compared to other drones from this price range, the Force1 UDI U818A comes with a decent list of perks. Made of lightweight materials, this model is not only very easy to carry around – but it can also go at fairly high speeds. This drone generally flies steady and high – although this can also be affected by the environment. For instance, while its lightweight construction may allow you to fly it fast through the sky, it can also be easily swayed by strong winds. It is, however, stable enough to take decent pictures. Still, considering that the video quality stops at 720, you may not be able to take professional pictures – like you would want to take for a wedding, for example. The remote control is simple enough that even a kid would be able to use it. This is why many people consider this to be the best cheap drone for children. Bottom line: The Force1 UDI U818A is powerful, practical, and easy to use – making it ideal for a day out as you are trying to see more views with your family. If you are looking for something that you can use to perform stunts, then you may want to give the Holy Stone HS170 Predator Mini RC a try. This quadcopter is easily controlled – so easy that even a kid could use it. This quadcopter has a construction that is lightweight enough to do stunts and fly very quickly – making it perfect to use in a race. Furthermore, while it may be lightweight, this unit is also windproof. This means that if a gust of wind suddenly passes by, the drone will not lose its stability. Since it has no camera, this drone is not a good choice for you if you want to film the landscape below it. Bottom line: The Holy Stone HS170 Predator Mini RC is perfect for the adventurer in you and is ideal if you want to perform some stunts in the sky. It is not, however, a good option if your purpose is to film. The DBPower MJX X400W has been recognized as a game changer when it comes to drones. Featuring wireless connection, this flying unit allows you to see the images in real time – and not just snap the pictures. 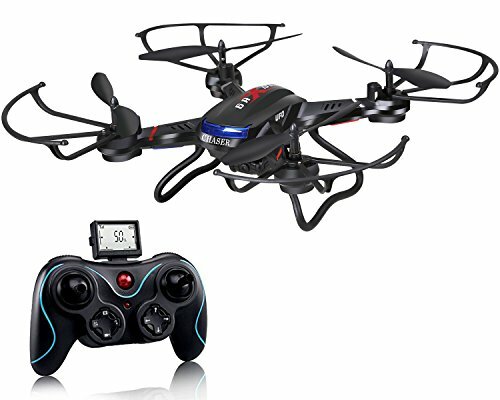 Featuring a headless mode for beginners, this drone is easily controlled even if you do not have much experience in handling drones. The battery life for this drone is also at around 8-9 minutes – which is why it’s considered a beginner’s drone. However, because of the 3.7V 750 mAh battery, it takes more than the average drone to charge – around 4 hours. Bottom line: The DBPower MJX X400W is a good choice if you want to get some “flying practice.” It may not have the features of a highly professional tool, but it can still offer you a decent kick. If you are tired of only being able to fly your drone for about 10 minutes, the QCopter QC1 is perfect for you. Made for hobbyists, this unit can last as long as 30 minutes in the sky. Considering that it’s wind-resistant, this will not lose its stability when a gust of wind passes by. Furthermore, considering that its camera has a 1080p quality, you can even use it to film more important events or areas. It’s decent enough to use it in real estate. Bear in mind that this drone does not have a GPS-return function, so you may want to keep it close. If not, you risk $100 flying into the sunset. Bottom line: The QCopter QC1 drone is a good option if you want to take some clear pictures. Its battery life is also long, setting it apart from beginner-level drones. The Drocon X708W is a good option for beginners. Having a remote control with very few buttons, it can even be used easily by a child. Having two-speed settings, you may easily turn this drone from “scouting mode” to “recreational stunt” mode. The first speed is the better choice for beginners. Considering that the camera resolution is only 720p, you may not be able to get professional-level pictures. They are, however, clear enough to offer you a clear image of the ground, without missing out on any of the important details. 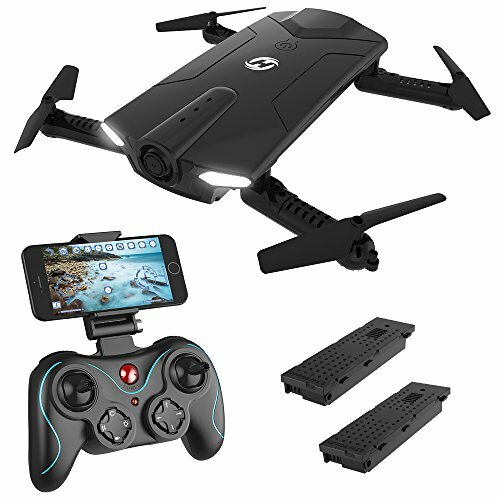 Bottom line: The Drocon X708Wdrone may not be the first choice for professionals and hobbyists – but if you are a beginner, you can definitely take advantage of it. 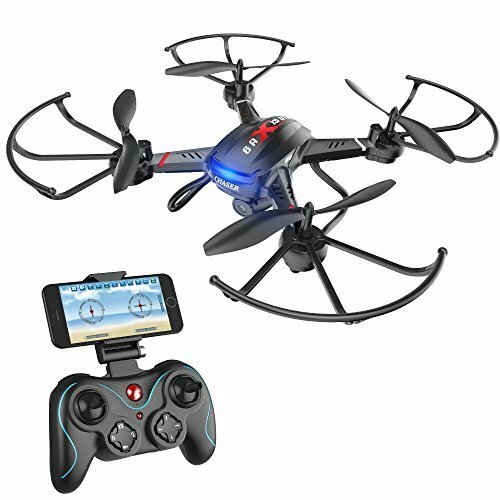 The Eachine E58 RC drone is the perfect thing to have around if you have kids. While it may not be the best option if you want to film a big event such as a wedding or take a detailed panoramic image, it’s a great option if you want to get a clear image of your neighborhood. 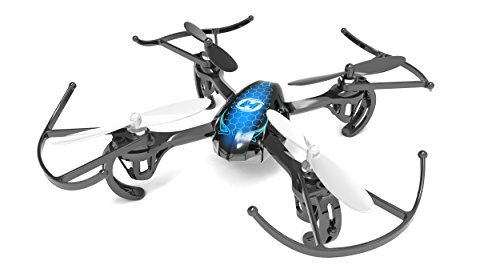 An advantage that this drone brings is that it uses normal AAA batteries – so you won’t have to panic around looking for replacements. You can just buy them from the convenience store. The Eachine E58 RC also has a place where you can store your memory card. This means that if you have a card that holds 32GB, you can take as much footage with your drone as you like. Bottom line: If you are a beginner looking for some entertainment with a budget-level camera, then the Eachine E58 RC is a good option for you. If you’re not entirely confident in your navigational skills, then you might want to purchase the Syma X5C and go a little bit crazy. It does not only have a fairly easy setup, but it’s also very simple to launch. Featuring a head-free mode, this is the kind of drone that will not confuse you each time you are trying to take a turn. This will help prevent any accidents caused by poor stability. The battery life of this drone is exactly what you would expect from a beginner drone. Being able to fly for around 6 to 10 minutes before you need a battery charge, it may not be a good option if you want to use it professionally in the large field – but it’s a decent choice if you only need to snap a few pictures. The camera is moderately stable and the 2GB MicroSD card allows you to store a fairly good deal of pictures. Plus, considering that it’s what you would call a “quadcopter,” it’s very easy for you to control its movements. Bottom line: Overall, the Syma X5C is a simple-enough drone that comes with a lot of perks. It does not take a lot of space, and you can get a lot of quality footage with it. Okay so the Holy Stone F181W - Chaser costs more than $100 – but we think it’s worth the extra twenty dollars. If you are looking for something that is ready to fly right off the bat, the Holy Stone F181W - Chaser is ready to impress you. Arriving already assembled, you do not even have to put the batteries in; it’s all set. The video quality stops at 720p, and it sometimes tends to lag; however, while it may not be suitable to get professional footage of an event or a landscape, it’s still good to use if you are a beginner or a hobbyist. This drone can also feature live videos – and what sets it apart from other Holy Stone drones is the fact that is has a bigger remote screen. This way, you can see in better detail what’s going up in the air. Bottom line: It may have its flaws, but the Holy Stone F181W is perfect for a beginner. It’s easy to use, it’s practical, and it gives you clear footage of the ground under normal weather conditions. Before you buy a drone, you should read this guide. Here you’ll learn what to do and what not. Learn what drone type suits you best as this will help you buy the right drone. To buy a drone, you need to know a thing or two about these devices. While there may be countless reviews or tops analyzing the best drones, you need to understand what you are buying. That knowledge will be able to explain to you why a certain drone is more expensive than the other, or quite the opposite, why it asks for a lower price. Basically, a drone is an unmanned flying vehicle. Most drones available for purchase are for civilian use, and they also go under the name of “quadcopters.” A quadcopter has propellers (four in total) placed on the corners of the device, and it usually takes an X or an H form. These unmanned vehicles were first made during the First World War, as an attempt at making an aerial torpedo. The first models would either be launched by a catapult or would be flown around by means of radio control. The first self-functioning drone was called the Kettering Bug, and it flew successfully during the first few tests. However, before any other tests were conducted, the war had already come to an end. Any improvements to the Kettering Bug stopped then. These developments were picked back up during the inter-war period. In 1935, the Brits made the first aircraft completely controlled by radio, and it was used at that point for training purposes. It was at this time that they started using the word “drone” for these pieces of aircraft. After this, drones were used as reconnaissance tools during the Vietnam War. They would also have other roles such as decoy or to launch a missile on a fixed target. Drones were also used to drop leaflets and letters during psychological operations. Today, drones have many functions and you may use them for countless types of activities. You may use drones to monitor climate change, to film and catch photos, or to carry search and rescue operations after a natural disaster occurs. Drones were also particularly helpful during the 9/11 terrorist attacks. Being used mostly for surveillance missions and terrorist-attack prevention operations, their production has increased greatly – to the point where they are now also used to film weddings and make aerial plans of a land. 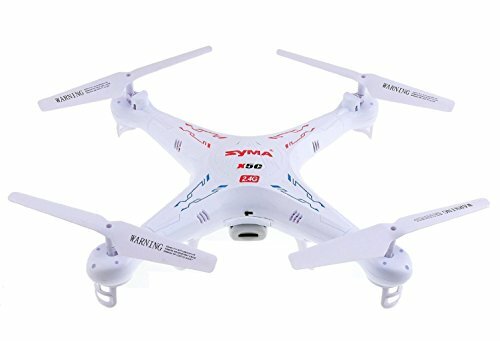 Is Buying a Drone Under $100 Worth It? In the past, good drones would cost you a lot of money. It would take plenty of investments and practice to create a properly-functioning product – which is why it would be so expensive, to begin with. Think about smartphones: at first, they weren’t really affordable, were they? But now, you could get a model with some very good features at an actual decent price. The reason is simple: they now know how to make them in a fast and efficient manner. The same thing goes for drones right now: a good drone is not necessarily going to cost hundreds of dollars. Granted, it may not be the newest model on the market – but a device does not have to be new in order to be good. It just has to be smartly made. At the same time, with every new model, the price on the old one goes down – until it eventually reaches an affordable stage. This does not mean that the quality of the product goes down; it just means that the hype is now on the newer models. So, is it worth it to buy a drone under $100? It certainly is. Generally, when you are going for a more expensive model, you are either paying for the brand or you are paying for the status of “shiny and new.” Price and quality-wise, it’s more convenient to go for a more affordable option. No drone is the same. They may have been similar in the beginning when we did not have many options – but now that technology has improved, we have all kinds of choices available. Beginner drones are generally the most affordable option since they have the shortest flight time and range. They are very easy to fly, and they are built to be durable. Therefore, they withstand abuse and minor crashes. Considering they are so low-priced, it’s fairly easy to find spare parts for these types of drones. Drones for hobbyists are durable and affordable, but they were also made with several advanced features that separate them from the “beginner” type. These features may be anything; they may take the form of longer ranges, specialized cameras, or other features that will make them ideal for recreational use. They’re the “basic drones” that have received a power-up. These drones are more expensive than beginner or hobbyist drones, and they have various photographic qualities. Made with high-quality cameras, these drones are used for surveillance and capturing pictures. Photo drones are also equipped with a GPS tracker that allows them to “come home” safely. This is a fairly good option if you use the drone to scout for landscape. Racing drones were built for their speed. Depending on the model, these drones can go 70MPH – and even 100 MPH in just one dive. They are equipped with a first-person camera that you can look through – and therefore feel as if you’re the one inside the drone. 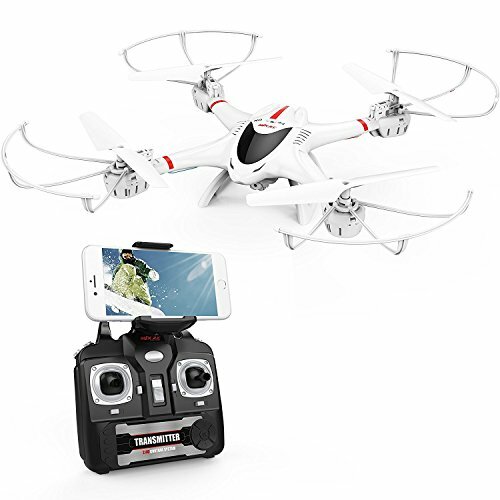 These drones are generally used in racing – or other circumstances that require quick movements. Considering the increasing popularity of drones, it’s not difficult to understand why the confusion is so great. In this case, there are two types of drones that you can go for: fixed wing or multi-rotor. A multi-rotor drone – also known as a multicopter or a rotary drone – uses motors mainly to keep itself in the air. They usually have a large array of movements, and they can fly both vertically and horizontally. However, these types of motors are slower than fixed-wing drones. Having aerodynamics resembling that of an airplane, these types of drones simply “glide” through the air – and are the top choice for racing. Still, because of the wings, these drones will require a fairly big deal of space. They are not really a good choice if you need to take a picture from a small area. You will need wide take-off areas, as well as large landing spaces. Like we have already mentioned, drones come in various shapes and forms – along with different features to look for. Depending on how you plan to use that drone, there are several features that you might want to consider. The last thing you want is for your drone to give in when you need it the most – so you must be particularly careful about the battery. Granted, a drone with a longer battery span will cost a lot more than one with a shorter span, which is why you need to decide what is most important to you. Worst-case scenario, you may want to buy one with extra or rechargeable batteries. How important is the quality of the camera for you? Do you just need to see the image so that you can maneuver it, or do you want to take clear, professional pictures with it? If you’re working in real estate or the wedding industry, you might want to invest in something with a more powerful camera that can also record HD videos. This is an option that is very useful for beginners since driving with the “head” can be confusing. Let’s look at it this way: if the head of the drone is pointing to the front, then once you turn the stick right, your drone will also go right. On the other hand, if the drone is facing you, then a left turn on your stick will make the drone go right – simply because that is its left. The headless mode will take away this confusion. Therefore, if you turn the stick to the right, the machine will also go right – regardless of where its head is pointing. This will prevent any accidents from happening. The gimbal will prevent your footage from being all unclear and wobbly when you record. If you don’t have a gimbal, the drone will still fly and record – but will also change its directions and tilt a lot when it’s flying around. Needless to say, if you want to have professional-looking footage, then you’ll need a gimbal. How long can you send your drone before it starts losing signal? If you don’t plan to take your drone far away from sight, then a short range will be the most affordable option. However, if you plan to do some long-range scouting, you might want to pay attention to the range of the flying unit. At some point, you will lose control of the drone. It will start flying like crazy or it will just fall – ending it into a nice, big crash. It would be a shame if your “droning” would stop from just a broken rotor, so you might want to make sure that the parts are replaceable, have spares – or that they can at least be easily found and purchased. Drones come in various shapes and sizes. You can get them to snap a few images of your neighborhood, you can use them to perform a few stunts, or you can use them to keep your kid busy for a few hours. Before, you would have to pay loads of money to get your hands on such a drone. Now, the technology is at the tip of your fingers, and you can get a high-tech drone for less than $100. Also, the low price is no longer a “symptom” of something cheaply made. Yes, it’s affordable, a.k.a “cheap,” but the quality still remains – if you know what to look for. All drones models presented in this article were under $100, which means that you will not have to fork out much money.